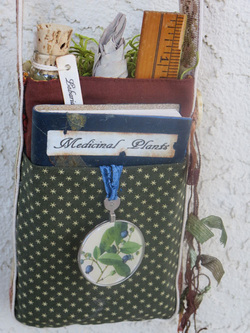 "It is a Lichen Day" medicine bag, (front) inspired by the writings of Thoreau and the book Waking With Thoreau, by Jeffrey Riordan Hinich. 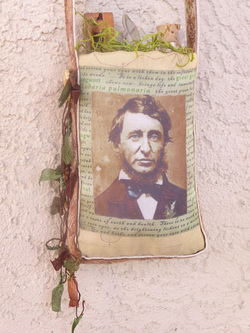 Maxham's daguerreotype of Thoreau, printed on silk. cotton, moss, ribbon, text, glass corked plant specimen bottle, ruler, pencil, sage bundle, optometrist lens, notebook. qool bag with photo collage on fabric. twig, glass button, sari yarn, antique key and feather pendant. contains, greek sage and black tourmaline. promises the wearer protection, connection to the earth, mystery. Hand stitched. 3" x 3-1/2"